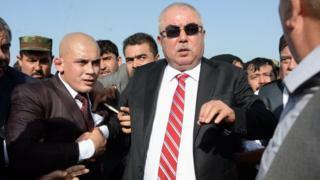 Officials say the attackers ambushed Gen Dostum's convoy in Balkh Province. Gen Dostum joined Afghanistan's unity government in 2014 and is a controversial political figure. He helped the US oust the Taliban in 2001 but has been blamed for some of the worst atrocities in the country's long-running civil war. Gen Dostum's reappearance was preceded by unrest in his northern powerbase, as supporters demanded his return and the release of a militia leader.